A spokesman for Palm Beach Gardens police in Florida confirmed to the BBC they were investigating a fatal crash involving the Grand Slam champion. A man was taken to hospital after the accident on 9 June and died two weeks later from his injuries, he said. Police believe she was at fault but her lawyer says it was an accident. She has not been cited or charged. The man who died, Jerome Barson, was travelling with his wife who was driving their vehicle through an intersection when the collision happened. Ms Williams' car suddenly darted into their path and was unable to clear the junction in time due to traffic jams, according to witness statements in a police report obtained by US media. Mrs Barson was also taken to hospital but survived. "[Ms Williams] is at fault for violating the right of way of [the other driver]," the report said, adding that there were no other factors like drugs, alcohol or mobile phone distractions. 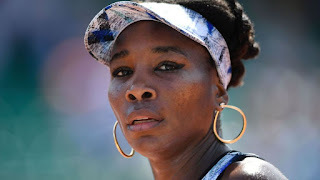 The 37-year-old, seven-time Grand Slam champion reportedly told police she did not see the couple's car and she was driving slowly. Ms Williams' lawyer Malcolm Cunningham told CNN in a statement: "Ms Williams entered the intersection on a green light. The police report estimates that Ms Williams was travelling at 5mph when Mrs Barson crashed into her. "Authorities did not issue Ms Williams with any citations or traffic violations. This is an unfortunate accident and Venus expresses her deepest condolences to the family who lost a loved one."